The Toronto Transit Commission (TTC) recently announced that QM Environmental, a Canadian environmental and industrial services company, had been named as the emergency spill response provider for the organization. The TTC is responsible for providing public transit for the 2.8 million people in the City of Toronto. Under the contract, QM Environmental will provide complete spill response services for the TTC, including the removal and disposal of vehicle fluid spills, effective immediately through to April 2020. The selection process was based on the service provider’s history responding to, and working on, emergency response and environmental protection, adherence safety and quality, and the expertise in handling challenging and sensitive emergency projects. 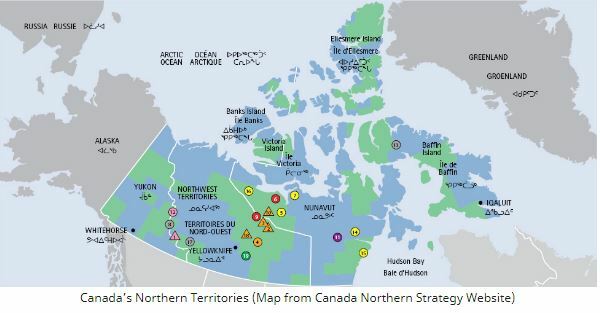 The federal government recently announced that Canada-based BluMetric Environmental (TSX-V:BLM) was awarded a four-year $4.5-million contract to remediate contaminated sites in Canada’s northern territories. The contract is a standing order for consulting services in the remediation of contaminated sites across the Yukon, Northwest Territories and Nunavut. The federal government’s tender notice states that the firm will be called upon to consult on various projects as needed. BluMetric initially said it anticipated specific revenues in each year of the contract, but has since retracted those estimates, saying it is unable to give accurate information on per-year revenues and associated costs. BluMetric has previously won contracts for northern environmental consulting, landing $2.2 million to design water treatment systems in 2016 and $3.45 million for environmental site assessments in 2015. Arcadis, a design and consultancy firm, recently completed an approximate $8 million contract by the U.S. Army Corps of Engineers (USACE) Baltimore District to locate and safely remove pieces of World War I-era artillery boosters from three New Jersey beaches. The project follows Arcadis’ selection as one of nine contractors for the Multiple Award Military Munitions Services II contract valued at up to $240 million over five years to support the USACE Baltimore District with military munitions and environmental response services. The artillery fusing pieces were inadvertently placed onto the beaches during the pumping of sand from the ocean when screening baskets failed to capture the small objects. The sand was brought ashore as part of a coastal storm risk management project after Hurricane Sandy along 7,600 feet of beach in Loch Arbour, Allenhurst and Deal in New Jersey. The boosters, similar in size to a C battery and made of brass, are part of components that would connect a fuse to the explosives in an artillery round to make up a WWI-era projectile. While not armed, the boosters may contain aged explosives. To fully address the hazard, USACE Baltimore enlisted Arcadis to excavate and screen the sand placed during the beach-fill operation. The project was successful in safely removing the munitions and allowed beach activities to return to normal prior to the 2017 beach season. Removal and screening operations began in late-2016 and were completed before the end of March 2017. Portions of the beaches were closed during the project to keep the public safe from heavy equipment. As the prime consultant, Arcadis was responsible for all excavation and screening across more than 70 acres of shoreline, public outreach including health and safety briefings, distribution of informational materials and the involvement of local businesses through the duration of the project. Aviva Insurance Co. of Canada v. Intact Insurance Company. The outcome of the decision of Aviva Insurance Co. of Canada v. Intact Insurance Company1 should remind insurers that even though the insurance industry has taken steps to ensure that contemporary CGL policies contain wording that is characterized as the “absolute pollution exclusion,” old wording, generally described as the “qualified pollution exclusion,” can still come back to haunt them. In Aviva v. Intact, Aviva and Intact had insured Avondale, the operator of a gas station business adjacent to the plaintiff’s property (Intact from 1983-1991, and Aviva from 1993-1999). The plaintiff alleged that contaminants from the property from where Avondale operated (“Source Property”) had migrated onto the plaintiff’s property, causing damage. Aviva brought an application for a declaration that Intact had a duty to defend Avondale with respect to the allegations made by the plaintiff. Aviva denied coverage under its CGL policies on the basis of the wording of the absolute pollution exclusion, however, it also insured Avondale under several umbrella policies (from 1993-1997), in which the pollution exclusion contained the words “sudden and accidental”. As such, and based on the pleadings (discussed below), Aviva acknowledged the duty to defend for these specified policy periods. Despite this language, Intact maintained that the wording in the Statement of Claim led to the conclusion that the contaminants had not escaped in a “sudden” or “accidental” fashion. Specifically, the word “migrate” had been used throughout the Statement of Claim, and, on a plain reading, “migrate” is not synonymous with “sudden.” Accordingly, Intact argued that the exception to the exclusion (immediately above, in bold) did not apply. …While the damage to the Contaminated Property may have been slow and gradual because of migration of contaminants from the Source Property over a period of months or years, the exception may still apply, in my view, if the discharge, dispersal, release or escape of Contaminants onto the Source Property was accidental or happened over a brief period of time. Such a determination is possible whether or not the word “sudden” as used in the exception, properly interpreted, has a temporal component. Accordingly, the Court held that the Intact policies from 1983-1986 had been triggered by the allegations against Avondale, and consequently, Intact was obliged to provide a defence. Justice Cavanagh also made an interesting ruling on the apportionment of defence costs. Recently, courts have appeared reluctant to make such a ruling so early in the game. Rather, they have concluded that the apportionment of defence costs is something to be agreed upon by the parties, and/or to be determined at the end of the proceedings. This often resulted in further speculation and delay – an unenviable position for insurers to be in. Aviva submitted that it had incurred over $100,000 in defence costs. As evidence, it submitted invoices which were almost entirely redacted save for counsel’s name and the billable time spent. Intact responded that it would not make a contribution without being able to examine the un-redacted invoices. Though Justice Cavanagh had “no reason to question the reasonableness of the charges”, he agreed that Intact should be provided with further information before having to pay 50 percent of past expenses. With respect to ongoing defence costs, Justice Cavanagh reasoned that such a determination should be governed by “equity and good conscience”, and that since both the Intact and Aviva policies were engaged for approximately four years, Intact should share defence costs equally with Aviva going forward. Interestingly, there was no indication that either insurer would be able to seek a re-apportionment of those defence costs at the conclusion of the underlying litigation. This certainly breaks from tradition, wherein insurers are able to seek re-apportionment of defence costs at the conclusion of the matter, based on the facts determined at trial. The Aviva decision ought to be a warning to insurers who may be asked to provide coverage under exclusions that contain the word “sudden.” The qualified pollution exclusion has gone the way of the dodo, and for good reason. Insurers should take comfort, however, in the fact that the Aviva case provides certainty and clear guidance to insurers on the qualified pollution exclusion: when faced with situations where old policies with old wording are at issue, insurers should focus on the source of liability, not the cause of the damage. This decision also provides an example of defence costs being apportioned before the facts of the case are decided. This may be helpful in providing certainty to insurers, but on the other hand, the decision to apportion defence costs on a 50/50 basis going forward may prove to be inequitable once further facts are discovered. It will be interesting to see if courts follow this aspect of the ruling in future cases. Murphy Oil Co. Ltd. et al. v. Continental Insurance Co., 1981 CanLII 1895 (ON SC). Zatko v. Paterson Spring Services Ltd., 1985 CarswellOnt 796 (Ont. S.C.). BP Canada Inc. v. Comco Service Station, 1990 CarswellOnt 637 (Ont. S.C.). Jennifer O’Dell’s ability to drive a file forward to a successful conclusion is a hallmark of her growing insurance litigation practice. Known for her persistence and ability to quickly assess the strengths and weaknesses of a case, Jennifer is able to resolve files quickly, and in some instances, before a formal Statement of Defence is ever issued. Jennifer’s clients, and senior counsel at the firm, rely on her commitment to quality and her ability to deliver timely results. Jennifer believes that advocacy requires excellent communication with counsel, the courts and her clients. Though always willing to use to the court system to further her client’s interests, she has a keen understanding that the success of her files often starts with an initial phone call to opposing counsel. Jennifer’s practice includes insurance coverage, personal injury, professional liability, property damage, environmental claims and occupiers’ liability. The varied nature of these matters requires Jennifer, above all, to find both comprehensive and practical solutions to her client’s complex legal questions. 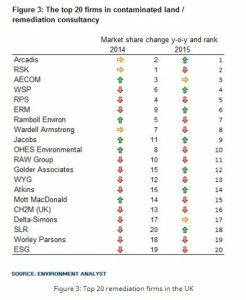 http://hazmatmag.com/wp-content/uploads/2017/07/Jennifer-ODell-Blaney-McMurtry-LLP-140x105.png 105 140 John Nicholson http://hazmatmag.com/wp-content/uploads/2017/01/hazmat-logo.jpg John Nicholson2017-04-26 09:21:132017-07-21 07:25:45Aviva Insurance Co. of Canada v. Intact Insurance Company. One of the most perplexing problems for protective clothing users now has a clear solution — literally. An AntiFog Expanded-View Visor, developed by Kappler, means no more fogged-up face visors for gas-tight suit wearers. A video demonstration may be viewed here: http://www.kappler.com/index.php/products/antifog. There have been many efforts to address this common problem over the years, from wipes to sprays to homemade concoctions. But cost-effective solutions have eluded protective apparel manufacturers until now. The patent-pending visor technology is being combined with another key “see better, work safer” improvement: A large, expanded-view visor which significantly increases the suit wearer’s field of vision with 17% more visor surface area. The AntiFog Expanded-View Visor is being incorporated as a standard feature on all Kappler gas-tight suits made with Zytron® and Frontline® fabrics, including NFPA-certified styles. As reported in Israel21C, Israel’s national ambulance, blood-services, and disaster-relief organization (Magen David Adom – MDA) recently launched a new emergency response unit called “Life Riders” that consists of emergency response personnel being equipment with electric bicycles (“e-bikes”). Each of the 1000 members of the voluntary unit is provided with resuscitation equipment and other medical supplies and can be summoned to scenes within a radius of 10-kilometers as first responders. The additional of e-bikes will allow unit members to reach very crowded areas, or areas where ambulances and Medicycles can’t drive through, such as boardwalks, markets and alleys. Life Riders marks the first time electric bikes have been used for first response anywhere on an organized basis. The idea is that they can maneuver in tight spots better than motorcycles and ambulances. “MDA has a wide variety of lifesaving vehicles compatible with a variety of scenes and conditions. In order to cut emergency response times, we’ve decided to integrate electric bikes into our array of vehicles – something that’s unheard of in any other EMS organization around the world,” said Eli Bin, MDA Director General. MDA first piloted the electric-bike squad near the light-rail construction zones in Tel Aviv, the Bat Yam boardwalk and the market in Petah Tikva. In the first of our two-part market review, Environment Analyst explores changes to the competitive landscape, how firms are coping with the skills gap, and how regulation and funding changes are impacting the provision of contaminated land and remediation consulting services. Environment Analyst’s previous examination of the contaminated land consulting sub-sector three years ago revealed companies were enjoying a tentative return to growth boosted by growing demand from the infrastructure sector, having weathered the downturn brought about by the credit crunch and recession (Environment Analyst 02-Oct-14). Recruitment to boost specialist teams was on the up following several years of redundancies, with firms at that time on the whole predicting continued growth for specialist services in this area. Although the recovery has not been as fast as many would have hoped for, with the revenues still not quite reaching the £253 million peak recorded in 2008 according to Environment Analyst’s latest market figures (see Figure 1). But positively the contaminated land/remediation consulting segment did grow by 14% to account for a 14.6% share of total UK EC market revenues in 2015, cementing its position as the second largest EC sector for the fifth consecutive year – have been previously knocked off its long-held top spot by the environmental impact assessment & sustainable development service area in 2010. 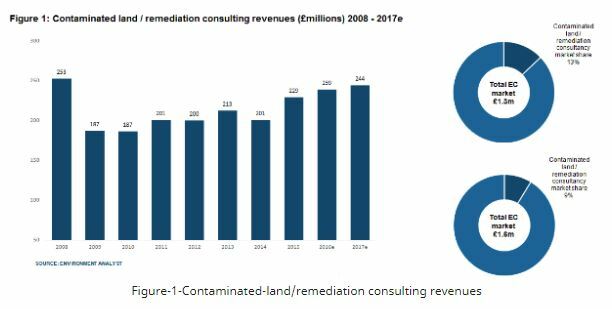 Many environmental consultancies are now experiencing continuous growth within their contaminated land activities even despite the difficult conditions in some sectors such as oil and gas, largely thanks to the recent strength of the UK’s infrastructure and housing markets. Although the recent solid economic performance indicators have given many the confidence to drive forward recruitment strategies in this area over the last couple of years, the ramifications and uncertainties surrounding Brexit has impacted how they are now viewing the outlook in terms of growth prospects going forward. The realities of the government’s post-recession austerity measures and a decision by the ex-chancellor George Osborne to wind down funding for the Part 2A scheme as of April 2014 – which is set to stop altogether in April this year – has left most local authorities unable to continue their own contaminated land investigations. Consequently the driving force for contaminated land sector has switched even more heavily towards private sector developers and their efforts to identify land ripe for new housing schemes and the planning process itself. The current Conservative government seems happy to leave it this way, having pledged to introduce a statutory brownfield site register for which they want LAs to allow 90% to gain planning permission by 2020. However, this could of course conceivably all change with the impending general election. Although the government-funded Part 2A work on behalf of LAs itself has itself been winding down, many hard-pressed councils that have seen a brain drain of in-house expertise as a result of funding cuts have been forced to turn to external consultants on an ad-hoc basis to fill the gaps when enforcing the regime. Loaring describes how Landmark has essentially benefited from this trend: “We recently won a tender to fulfil the regulatory Part 2A function of Christchurch and East Dorset Council. We see the trend of councils tendering the work previously designated for a contaminated land officer as one which will absolutely accelerate. We are now in a position where the regulator is outsourced to a private enterprise – which is quite interesting”. WSP too has seen some key shifts in its customer base as a result of these and other changes, with Moore explaining: “Business in this area has been moving back to how it was before 2007. Property and construction is now our biggest contaminated land market, followed by oil and gas and industrial. We have slightly more private sector clients than public, with approximately a 60:40 split”. The 85-strong consultancy OHES has also sought to extend its services to the development sector having previously focused elsewhere. Bryan Cherry comments: “Before the recession we relied very much on the fuel market rather than property, so we were able to ride out that period of uncertainty. But in the last three years we have expanded outside that market – we are doing more for developers now in property and also supporting business mergers, property sales and acquisitions. Recruitment to help fulfil the expanding order books remains a challenging area for many of these firms, with the sector now paying the price of the loss of talent through redundancies made during the recession years – meaning today that competition for fresh talent is intense. Golder concurs on the present difficulties. Business unit lead for site characterisation and remediation Robert Noden says: “Recruitment can be tough, finding the right people is difficult, especially at an intermediate and senior level. However we have good staff retention which makes this easier. Thomas from RSK also agrees that it can be very difficult to fill senior position vacancies, stating: “The challenge we have is that there isn’t the right number of candidates available with the right skills. People left during the recession and firms took on less graduates but now we see the shortage of staff with three to five years experience. This year saw the launch of a new qualification for contaminated land management professionals. The National Quality Mark Scheme (NQMS) should help further improve the standards of work and quality of submissions under the various regulatory regimes – including planning applications – relating to previously used land. It will provide visible identification of documents that have been checked by suitably qualified and experienced persons (SQPs) prior to submission. For candidates to be recognised as an SQP they must possess a recognised and assessed level of experience and knowledge. Persons already registered under the established specialist in land condition (SiLC) scheme are able to qualify as an SQP by undertaking a conversion course. Overall he believes “it’s very encouraging to see the industry upscaling and ensuring professional qualifications are in place”. Thomas hopes the scheme will have a long-term positive impact on the sector, including she believes “the streamlining of the planning process, as some of the simpler sites could go through the process a lot more quickly, benefiting developers”. “It will ensure that submissions will have had a level of scrutiny over and above a typical technical review, so authorities will have more confidence in the report. What’s more hopeful is that it will improve quality standards across the industry as it becomes the norm rather than a more robust level of site assessment,” she concludes. This article has been republished and first appeared at https://environment-analyst.com/55824/market-insight-trends-in-uk-contaminated-land-consulting-part-i. In December 2016, the Government of Canada announced a government-wide strategy to protect Canadians from exposure to asbestos. As part of this strategy, Environment and Climate Change Canada and Health Canada are developing new regulations to prohibit asbestos and products containing asbestos, by 2018. The Minister of Environment and Climate Change, the Honourable Catherine McKenna, recently announced that the Government of Canada will fully support the listing of chrysotile asbestos to the Rotterdam Convention and will advocate for it at the upcoming eighth meeting of the Conference of the Parties, in Geneva next week. The Government supports the objective of the convention, which is to protect human health and the environment by promoting informed decisions about the import and management of certain hazardous chemicals. In addition, the Government recently published a consultation document describing the proposed regulatory approach to manage asbestos and to solicit Canadians’ views on the proposed measures. Canada is a party to the Rotterdam Convention, whose objective is to protect human health and the environment by promoting informed decisions about the import and management of certain hazardous chemicals. Asbestos was declared a human carcinogen by the World Health Organization’s International Agency for Research on Cancer, in 1987. At the height of its use, asbestos was found in more than 3000 applications worldwide; however, production and use have declined since the 1970s.